Spring Has Sprung - Almost! If you're like me, you look forward to a fresh start at the first of the year. Setting goals for the next 12 months can be exciting and a perfect opportunity to assess where you're going and how you're going to get there. But don't overwhelm yourself by setting the bar so high that it's impossible to reach. If you can dream it, you can make it happen! So here's to a fabulous new year and best wishes to all our DSA members working to be the best in our wonderful industry. Spring Has Sprung - Almost! Spring is in the air and we're feeling energetic! If you want to get a jump start on your spring cleaning, consider getting yourself organized. Whether you work primarily from home, an office building, a design store or even your car, you can probably find areas that could use a good cleaning out. The more organized you are the more efficient you are. Saving time means saving money, and we are all interested in that! Remember, the more organized and streamlined your business is, the better you'll serve your clients. Happy clients mean more referrals and that also results in an increased bottom line. So take a look around and see where you can unclutter your life, both business and personal. Let's get started and get a jump on the spring season! Universal Design Living Laboratory, the national demonstration home and garden in Columbus, Ohio is nearing completion in preparation for a month of tours to the national media and the public in the spring. 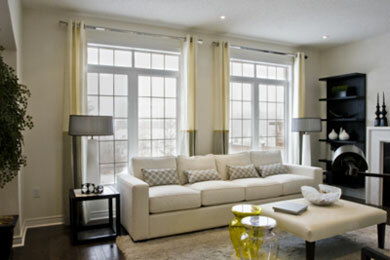 The home is focused on universal design, green building and healthy home construction practices. Currently 177 international, national and local companies are partnering with this project by providing products and services in exchange for ongoing branding and marketing opportunities at the home. The lower level of this 3,500 square foot home is serving as a seminar room for interior designers, architects and builders. Furniture is needed for the home, patio, screened porch, and seminar room. The net proceeds from the tours will go to The Ohio State University for spinal cord injury research. Rosemarie Rossetti, Ph.D., the UDLL homeowner, sustained a spinal cord injury on June 13, 1998 when a 7,000 pound tree fell on her while she was riding her bicycle. Furniture manufacturers should contact Rosemarie Rossetti, Ph.D. to discuss the specific furniture needs and benefits of being a contributor. DSA members, did you know? If your name does not appear on the DSA website, you may have skipped a step in setting up your member profile. Your profile appearing on the site will increase the ability of search engines, such as Google, to find you. Using the DSA initials after your name will increase public awareness. DSA provides a national certification course to increase your credentials. Membership to DSA can be used as a credential for professional discounts. DSA supports designers right to practice with or without the taking of the NCIDQ. Your membership card is available for print in the member section of the website on the left hand side once you've signed in. You can use your membership card for applications and professional discounts nationally. DSA is working for you. We look forward to your opinions and comments. Email us anytime at support@dsasociety.org. Click here to join at a reduced rate during our member promotion. The Council may be closed, but I am still alive and kicking. Let me introduce you to my new enterprise: Interior Design Protection Consulting. In this new capacity, I will be working exclusively with groups - not individual designers - to protect design freedom. These changes were necessary and are more of a restructuring than an ending. The old model of trying to solicit individual memberships to fund the corporation along with all the administration of a nonprofit were too burdensome for one person and taking much too much time away from what I do best - fighting anti-competitive regulations. I am reenergized and enthusiastic about continuing to fight for design freedom! You can - and need to - continue to take part in the process to protect your right to earn an honest living. You can still have access to information and assistance in keeping your state regulation-free. If you were previously a member of IDPC and have a group that would like to work with me, please contact me at pmorrow.IDPC@gmail.com for more information. California On Friday, Assembly Bill AB 2482 was introduced by Assemblywoman Fiona Ma on behalf of the Interior Design Coalition of California (IDCC). IDCC has been busy lobbying for this bill for the last two years, as well as holding meetings throughout the state to try and rally support from other designers and students. The bill has not yet been referred to any committee or hearings scheduled. More information will be forthcoming, but I wanted to give you a heads-up so that you can alert your members and have them on standby. Maryland HB 1051 has been introduced by Delegates Hixson and Gilchrist which would alter the definition of a "taxable service" under the sales and use tax to impose the tax on "interior decorator" service. In this difficult economy, with design-related industries impacted by the declining housing market, the state government should not impose additional taxes which would make it even harder for honest, hard-working citizens to put food on the table. If your members would be affected by this bill, please ask them to contact the members of the Ways and Means Committee, as well as their own legislator. North Carolina Good News! The hearing on the practice act has been postponed. We've been successful in bringing the issues with the bill to the chairman's attention, and he has pulled it from Wednesday's docket in order to further research. If you have not yet sent letters to the committee, keep your gunpowder dry for now. If you have already sent them, no worries, it helps keep the controversy alive. The tentative date for the hearing on the practice act is the week of March 19, but the committee staff has agreed to give us a week's notice. And naturally there is always the chance it will not be rescheduled at all, which is what I wll work towards. Author, Getting Grassroots Galvanized and Busting the Myth of the "Three E's"
Winner, RESA 2011 "Innovator of the Year"
Incandescent bulbs have been around since Thomas Edison and for over 130 years have done a fine job. They've recently run into problems as a result of the link between burning coal for electricity generation and global climate change. 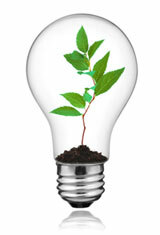 In January 2012 U.S. legislation will make our current incandescent bulbs obsolete. So, what does one do? Fortunately, there are options. Halogen incandescent bulbs are the easiest option. They physically look the same as our current incandescent bulbs but the light is slightly cooler. They are dimmable and last about as long as current incandescent bulbs. They are about 30 percent more efficient and therefore meet the new U.S. law. However, they also require careful handling as oil from our hands can cause damage. CFLs are not a perfect solution but offer a larger step toward sustainability. This is because they use significantly less electricity than incandescent bulbs (standard or halogen). Unfortunately, some consider them ugly. They last a lot longer than incandescent bulbs - maybe 10 times longer - but contain mercury, a toxin. Some are dimmable and some are not. Some still take a minute to reach full brightness. CFLs also popularized different color temperatures - as the early versions were cool. Obviously, CFLs have positives and negatives. Another option is LEDs, light-emitting diodes. LEDs can be more energy efficient than CFLs and do not contain mercury. They last longer than CFLs and produce a warm, incandescent-like light. This light, however, is very directional. 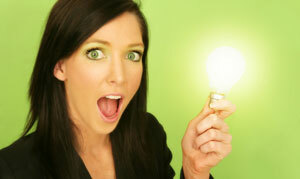 LED bulbs do not glow and emit light in every direction like incandescent and CFL bulbs. Some are dimmable and some are not. Many are designed for a specific application or fixture. About 75 percent of the electricity used by our current incandescent bulbs does not generate light, it generates heat. If your client switches to more energy efficient bulbs (halogen, CFLs or LEDs), the heat generated in that space inherently drops. As a result, less air conditioning will be required in the summer, saving money. Money will also be saved in winter because the heat generated by the bulbs (using electricity) is typically more expensive than heating with natural gas or propane. Using more efficient bulbs has the indirect benefit of reducing mercury emissions. Mercury impairs neurological development and is released to the environment when coal is burned to generate electricity. It is also a necessary ingredient in CFLs, which is why they need proper disposal where the mercury can be reclaimed. Because CFLs are more efficient and last longer than incandescent bulbs, CFLs release less mercury to the environment. By requiring improved efficiency, lighting in the U.S. just became more sustainable. Your challenge is to stay informed on the new options so you can specify the best choice for your client. We have heard time and again that independent designers want to offer their clients the high quality, wide assortment of products, and remarkable value that Ethan Allen is known for, says November Rawlings, manager of media and public relations. We have created the Ethan Allen Interior Design Affiliate Program (IDA) in response to these requests. Ethan Allen now welcomes qualified independent designers to become Ethan Allen Interior Design Affiliates and to benefit from special to-the-trade privileges. As an Ethan Allen IDA member, you earn a referral fee on every purchase*. Perhaps the most important benefit is that, because we process every order, oversee preparation and professional delivery, and handle customer service and logistics, you are free to focus on what you do best: interior design. Every product we sell has our full backing and support, including our warranties. Qualified interior designers are invited to apply. Applications are also available at your local participating Ethan Allen Design Center. Visit us at http://www.ethanallen.com/client_services_content?contentId=1848220 for full details and to download an application. Want to quickly and dramatically improve your website's visibility, rankings and traffic? Fixing only the TITLE tag on each page can often achieve this. The title tag is descriptive wording which you or your web designer create for each page. It's a hidden bit of code that's typically visible to visitors in the title bar of their web browser as well as the clickable blue headline of your page's listing on search results pages. Simply improving a title tag may result in significantly better rankings and more clickthroughs. Each web page should have a unique title that reflects the essence of what that particular page is about. Title tags should use the exact keyword phrase that you want to rank for and consist of no more than 65 characters and spaces (about 10-12 words). Place that exact keyword phrase at the title's very beginning. Repeat a variation of that keyword phrase later in the same tag. Write your title tags to appeal to people as well as to search engines. Avoid these errors in titles: use of the same title on all your pages, use of the word "welcome," use of your domain name, no title tag whatsoever, and stuffing the title with the same keywords over and over. Author Jerry Busche is a Search Engine expert with www.NestDesignGroup.com, which specializes in website design and internet marketing for interior designers and home stagers.